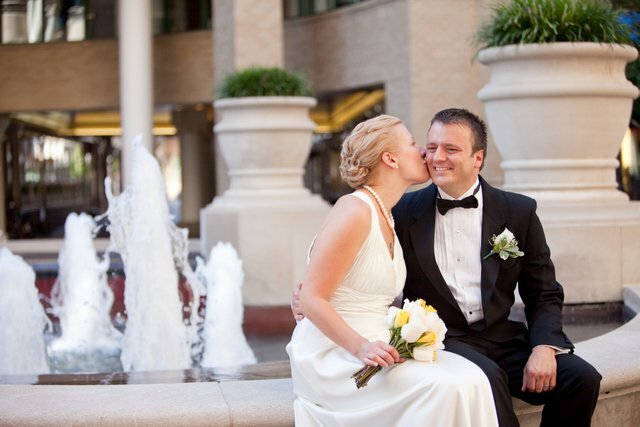 I wanted to take a minute to recommend Sergey Gogolev, our wedding photographer. We had an unconventional wedding. Having both been married before we decided that we didn't really want a big traditional wedding, but we still wanted to have a ceremony so we would remember the day by more than just a date. We reserved the Old Stone House for the date, and had an old friend who is an ordained minister perform the ceremony in September. So we set about looking for a professional photographer in May. It turned out to be a little trickier than we expected to find someone. Because our wedding was during peak season, many photographers weren't willing to commit to our 2 or 3 hour session, since they'd rather hold out for a full-day client. Or they would make us pay the full price for an all-day photography shoot. After making some inquiries of a couple other photographers we knew through friends of friends, and not finding someone who was going to work out for our situation, N. found Sergey through an ad on Craig's List. We met with him in Georgetown and he spent an hour with us at the Old Stone House and walking around Georgetown to find other good settings for pictures. We liked him and he had a nice portfolio. He was also willing do the work for us for a reasonable price. So we gave him a deposit and crossed our fingers. He encouraged us to have the ceremony in the morning because it would avoid the harsh afternoon lighting. Unfortunately we couldn't make this happen for a lot of reasons, so we just hoped for the best. When the day arrived, we ended up being an hour late to our own wedding. Good thing there weren't any guests. But Sergey was unruffled and we began everything around 3:00 PM, probably the worst time of the day for outdoor photography in the sun. Sergey, and his wife who was also shooting, took hundreds of pictures of us in various settings for a couple hours all around Georgetown. As the afternoon progressed we felt good about everything, he had so many interesting ideas for settings, poses, and so on. Even though we started an hour late, we were never rushed - quite the opposite, I think we had to cut things off because we were both about to drop from hunger by the time we finished! Barely two weeks later we were able to look at the pictures online. We were stunned. The package we had agreed to included 50 prints that would be edited and color-corrected, but there were so many incredible pictures that we literally took a month to choose our favorites. He gave us more than we had agreed to in the end, and delivered the prints in a beautiful customized box with a DVD. At every step of the way he was accommodating, easy to work with, and gave us far more than we expected. If you need a photographer I can't recommend Sergey highly enough. His skill and creativity are top notch and his fees are fair. And if the afternoon lighting was bad, well, you wouldn't know it from the pictures. We couldn't be happier. N. put many of our favorites on Facebook so be sure to check them out there if you're a friend.